THEY'VE ARRIVED! 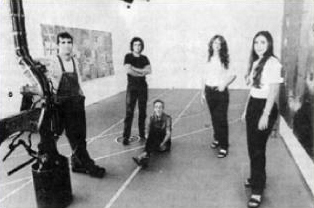 From left: Artists Daniel Fiorda, Pablo Contrisciani, Carolina Sardi, Karina Chechik and Luciana Abait. Their works are different, and their lives are different, too. The past and the art are the ties that bind Luciana Abait, Karina Chechik, Pablo Contrisciani, Daniel Fiorda and Carolina Sardi, five Argentine art ists who have settled in Miami. Something they share with most of Miami is their journey from another place to this new one, where immigrants have been creating new histories of themselves over generations. Their work speaks eloquently of that voyage in a joint project at the ArtCenter/South Florida. It is called DEPARTURES/ARRIVALS and is on display until May 2 at the center's 800 Galiery, 800 Lincoln Road. The story they tell is a history of immigration, and of never leaving home. lt is also a story about searching for new ideas, and they're each living it differently. Back in Argentina, they did not know each other. They're about the same age, early to mid-30s, and arrived here at different times, for different reasons. They met in Miami, and they're using this city as a canvas to express the physical and mental changes that come with the displacement and renewal most immigrants experience. Such art could not have been done anywhere else. "Miami is used to receiving people," Sardi said. "lt's an open place. If you want to stay, it allows you to stay. If you want to leave, it allows you to leave. It flows like an ocean." The symbol of that journey is the airport, where the magic of departure and arrival takes place. The exhibit takes you there, from the gates at the entrance to the landing strips on the floor of the gallery. Fiorda's sculpture 2 But Not 2, welcomes visitors as the side panels of the security checkpoint every traveler must go through. Fiorda grew up loving cars and machinery around his father's workshop in Buenos Aires, and he uses them in his design. For him, departure and arrival are not separate, but identical events. "They are mirror images of each other," Fiorda said. And like other immigrants here, these five Argentines who are among thousands of others in South Florida, live parlliel lives. There is a Miami life and a Buenos Aires life, and they run into cach other constantly. "When you come here it's not like you're leaving everything behind," said Fiorda. They're not exiles, nor are they refugees. They choose to come and go. They're here because like everyone else who has come before them, they want more opportunities - to express themselves and to take in new ideas. Sardi takes you aloft with her sculpture, Flying High. Using lines, dots and arrows, she makes the connections between people and the relationships that are never severed, even after one moves to new places. Since coming to Miami four years ago, she has been able to take her art to new heights, she said. "Miami allows me to grow up in my art," Sardi said. lt has been a life-changing jour ney, too, for Contriscíani, in Miami for the past two years. He's here because there are still boundaries to push here. New York City, for example, would never allow him to find what he has found in Miami. "Everything was done there," he said. "Here I feel like a pioneer. Here the place needs what evebody can express. There is no definite identity in Miami because it's a new place and we're part of that place." It is place of expanding possibilities, as Luciana Abait shows in The Game. It symbolizes the journey people make in search of new identities and new ideas. Players, represented by chairs, depart from a red panel and follow a narrow path. "When you're departing, there is something in the air that makes you want to leave," said Abait, the youngest of the group at 27. As the path gets wider, the players arrive into a blue panel. "Here, I'm very much at peace to do whatever I want," she said. "Friends, families have problems at home and we suffer, we're touched, but in a different way. Here, we're like in a cloud." Chechik remains the most connected to home in her work. Literature, specifically the writings of Jorge Luis Borges and Julio Cortazar, plays a strong part in her paintíngs. Both lived outside Argentina for a long time. The words of Borges are all over two panels she created in the exhibit, one ahowing a rail yard in Buenos Aires and the other an overview of a landing strip in Miami. lt could also be a highway. They're facing each other. On one of those is an inscription from Borges: "He who moves away from his home has already returned." Miami is not home yet for her, like it is for Fiorda, who has bought a house in Biscayne Park. He also owns a home in Argentina, as does Chechik. "lf I don't go to Argentina, l won t survive here," she said. "It's like the air I need to breathe." Life has been hard for her here, she said. To read Borges, to hear Argentine music, brings families, and her roots, close to her. "Where you feel better is not where you develop yourself better," she said. For Contrisciani, life has been departures and arrivals, and "the concept of home is inside." Gary Knight, executive director of the center, said this exhibit reaches out and speaks directly to Mian's community. "Virtually everyone in South Florida is an immigrant," Knight said. "By and large, most people share the sense that they're from someplace else. Most people can identify with that transition from someplace else to here." About 600 people saw the exhibit when it just opened, Knight said, and he expects another 4,000 to see it before it closes next month. A panel discussion, Departure Art vs. Arrival Art, will be held at 7 p.m. on Thursday at Art Center, 924 Lincoln Road. Participating in the discussion will be: Carol Damian, chair of FIU's visual arts department; Francine Birbragher, editor of Art Nexus and an art historian; Richard Shack, chairman of the board of ArtCenter/South Florida; and Ricardo Pau-Llosa, poet and art critic. Channel l0's Michael Putney will moderate.